5 Things We Learned From Isabella Boylston's Master Class on "Giselle"
Learning a variation for the first time is definitely one of the most rewarding parts of ballet. And when American Ballet Theatre principal Isabella Boylston teaches you that variation as part of a master class series hosted by dancewear brand Cloud & Victory, the whole process gets even more exciting. Dreamt up by Cloud & Victory founder Min, the day-long workshop at Joffrey Ballet School in New York City consisted of a technique class taught by fellow ABT principal Gillian Murphy, as well as variations from both Murphy and Boylston. After Murphy taught Black Swan, Boylston gave the dancers another classic with Act I of Giselle. If you weren't lucky enough to be among the dozens of aspiring ballerinas gathered at the master class, check out some of Boylston's tips for learning Giselle at home. The Joffrey Ballet School in New York is giving away an unprecendented number of scholarships this year. And one of the ways they're scouting talented recruits is through DanceMedia. Submit a 1 to 3 minute video of yourself in performance or in the studio to enter to win a full-tuition scholarship at one of the school's summer programs. A panel of DanceMedia editors will choose 10 promising students from the March contestants. Be sure to post your video before the 31st—you could end up spending your summer training for free! There's only one thing better than getting into the summer program of your dreams: Getting in with a full ride. The Joffrey Ballet School is running a brand new kind of scholarship contest this year. It has nothing to do with your technique or talent—just your passion. Returning students are invited to write a short essay about their past experiences at the Joffrey, while new ones can write about why they want to attend this particular program and what makes it so great in their minds. The school will select two students to receive full tuition (including housing and meals) to one of the school's nine intensives. Email your entry before the end of this month for a chance to win. You can find out all the details at joffreyballetschool.com/sp-scholarships. The only thing better than getting into a great summer intensive? Winning a full scholarship. 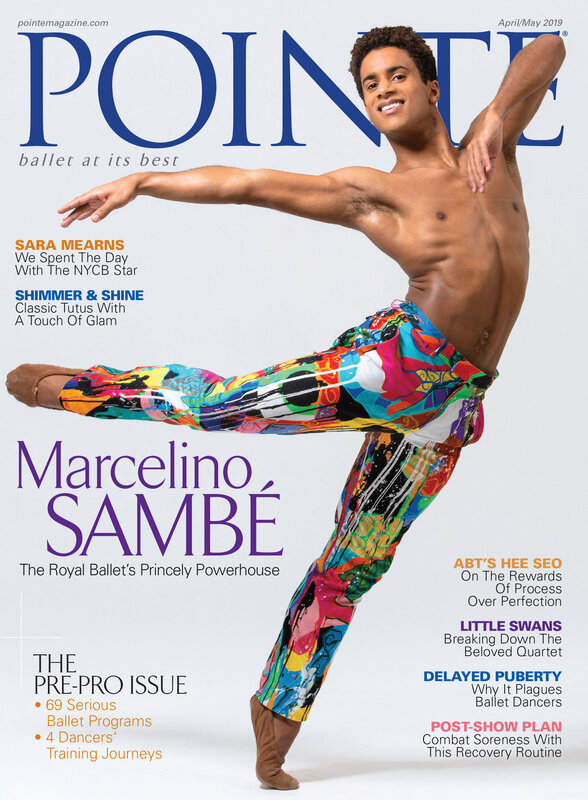 The Joffrey Ballet School has teamed up with our sister publication Dance Magazine to offer 30 promising students full-tuition scholarships to Joffrey Ballet School programs, including Joffrey Ballet Intensive NYC, Joffrey West LA, Joffrey Jazz & Contemporary NYC, Joffrey NYC Young Dancer Program, Joffrey Southwest Dallas and Joffrey Miami. There's no need to audition. Simply enter your best video into the Dance Magazine Video of the Month contest. A team of editors will choose the most promising students at the end of each month. There will be five scholarships awarded in January, 10 awarded in February and 15 in March. Good luck! It's fashion week in New York City, and the Joffrey Ballet School is getting its moment in the style spotlight. Louis Vuitton has sponsored "Reconstruction 3.0," a collaboration between Parsons The New School for Design, The New School for Jazz and Contemporary Music and New York's Joffrey Ballet School. Five teams of students from each program have created original choreography and music inspired by the French fashion house's heritage of travel, as well as costumes constructed from previous Louis Vuitton ready-to-wear garments. This Thursday, a panel of experts from all three artforms will watch the performances live at Manhattan Movement and Arts Center, just down the street from the runways set up at Lincoln Center. The prize for best in show? A trip to visit Louis Vuitton's atelier in Paris and the historic Vuitton family home in Asnières, France. Have you entered Dance Magazine's Joffrey Ballet School scholarship contest yet? Five dancers won full rides to Joffrey summer intensives through dancemedia.com in January, and ten won in February. This month is your last chance—and with 15 scholarships up for grabs, it's also your best chance! All it takes is uploading a 1-3 minute video of yourself performing a ballet or contemporary variation. So, what are you waiting for? The Joffrey Ballet School Performance Company is currently on tour in the South, and dancer Melissa Westlake is sharing her experience with Pointe. Our first full day in Charlotte, North Carolina, started off with an adventure: We taught some local kids selections from our rep, then performed with them on the court of the Time Warner Cable Arena before the Bobcats vs. Knicks game. What a feeling it was to hear the announcer say, “And now, performing alongside the young dancers of Charlotte, we have the Joffrey Concert Group!” And we were off! There were a few mistakes of course because, as we all know, no performance is ever perfect, but the feeling was irreplaceable. Onward it was to Rows O and P in section 123 where we screamed and yelled and cheered on the Knicks. (You can take the dancers out of New York, but you can never take New York out of the dancers.) My friend Kristina and I made it our mission to get a picture with rap artist Nelly, who was watching the game courtside. The other dancers doubted us, but fail we did not. It took jumping over a few chairs and creeping and crawling between people but we successfully got our shots! Off to the host families. After two nights at the Country Inn Suites in Charlotte, we were on our way to Statesville Performing High School of the Arts for our next performance. It was our second year at the school and we were excited to be back in familiar territory where we didn’t mind taking half an hour to space. While the men unloaded the truck with our treasure chest of costumes and props, the girls ran backstage to make sure that we got the biggest dressing room, seeing as there at least twice the number of girls as boys. But we couldn’t let the men do all of the work, so we grabbed the bars and prepared to take company class. The audience could not have been more appreciative. After the show, we sat and talked with the school’s dance program. There was nothing but laughter and full conversations in the room. Little Connor was a big hit, as always, showing off his awesome pirate skills. And just like that we were in our vans again dropping everyone at their new homes for the next two nights. One family was kind enough to invite some of us take a quick a dip in their pool, which turned into doing cannonballs into the lake and sitting in the jacuzzi for some much-needed relaxation in front of what was the most beautiful view we could have asked for. First night in hosts’ family homes was a success! I, unfortunately, had to pull the first all nighter on tour in order to get my schoolwork in order. It’s tough being on the road and having finals at the same time. But in a few weeks I will have finished my sophomore year of college! Performance number three was Larry Keigwin’s Air, Brian McSween’s One Last Breath, Dwight Rhoden’s Threshold Inlay and Gerald Aripino’s Kettentaz and Birthday Variations at Central Piedmont Community College. Being on all the different types of stages is really taking an effect. Tight calves, plus tight hamstrings from sitting in the car, Achilles’ starting to pull, quad muscles sore and even some very painful Charlie horses. This stage was by far one of the most difficult, spacing wise, because it was a trapezoid. We did not expect it to be that small or oddly shaped. With a little improvisation though everything ended up running smoothly. Afterwards, our host family gave us a quick trip on a two passenger airplane. Racing down the runway, the meter reached 60 RPM and the plan lifted off of the ground and off into the sunset we flew. The pilot even let me fly for a bit! Next up was Duke University in Durham NC. We arrived pretty early because Mr. McSween was headed off to teach a master class so there were about 4 hours to kill before our own class. The company scattered and explored the campus, then had a game of frisbee. I guess we stayed in the sun a little to long because after, a good majority of us looked like red tomatoes in the summer heat! It was a miracle we got through class and rehearsal afterwards. We had a class at 10 am and rehearsal at our associate artistic director’s, old dance studio, King David Christian Conservatory with Mr. Sal and Ms. Barb. This was an important rehearsal for us because we had a show the next day and unfortunately one of our company members, Kristina, was injured and two other dancers, Vanessa and Shaina, had to replace her. Anything can happen while on tour. After, Mr. McSween had to go and teach a master class so they gave us a day at the mall. We went shopping, watched a movie, and even had some frozen yogurt. And as soon as we got back to the hotel it was straight to bed, with a 7:45am departure time the next day. The studios at Carolina Dance Theatre in Raleigh were absolutely beautiful and the studio in which we performed in was twice as large as ours in Manhattan. Vanessa and Shaina were fabulous! For only rehearsing the pieces for a couple of hours, they truly did a fantastic job. Then it was back into the vans for another two and a half hour car ride back to Charlotte. In downtown Charlotte we were all excited to head to Fuel Pizza Shop where they have some of the best gluten free pizza. One of our company members, Victor, is allergic to gluten so it was a good meal for him, he could have had a whole pie by himself! As everyone went out to enjoy the last of daylight, I stayed in Fuel Pizza reading up on my child psychology class to prepare myself for a quiz that needed to be done by 11pm the next night. Then it was back to the hotel though to prepare for our next stop, Atlanta Georgia! Our day started off with an early morning birthday breakfast for company member Shaina and Mr. McSween. We were all pretty excited to get to Atlanta, just because it felt as is if we were in North Carolina for so long. On the way, we found a great state park with a beach, boats, a lake, any and everything that we wanted to do outdoors. An hour and a half went by pretty quickly, and it was time for us to go and meet our host families. Megan and I were sent off with the Cash family. A wonderful southern dinner was awaiting us: baked macaroni and cheese, pulled BBQ pork and a delicious fruit salad. It was an early night, but a very good one.